This morning I received some emails, blog comments and Momfiles Facebook page posts that I won 1,000 Swag Bucks in an hourly drawing. When I read the first message, I automatically assumed it was a scam. After about the 6th message I looked into it. 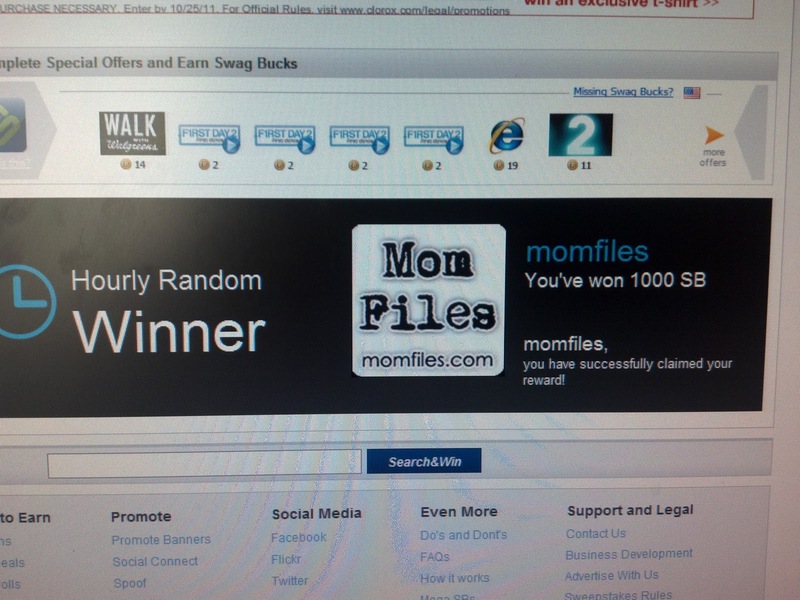 Turns out I did win the 1,000 Swag Bucks and was in complete shock! If you are not a part of the Swag Bucks community I encourage you to check it out and sign up for yourself. It WORKS! I have redeemed enough of my SB's to receive over $100 in gift cards all for FREE! It is great that all I did was search the web and get rewarded for it. Now you go get your Swag on~! Congrats!! I read about swag bucks on several of the coupon sites that I follow, but I've yet to check it out. I was skeptical. I know you're legit, *lol*, so I'll go ahead and give it a try now. You know, i've been meaning to get into all this Swag Bucks stuff, but i think this just inspired me to go ahead and do it. Wooohooo!!!! Congrats on your win! I joined Swag Bucks about a year ago. It's so easy. Search and win! You can't beat that. Congratulations on your winnings!